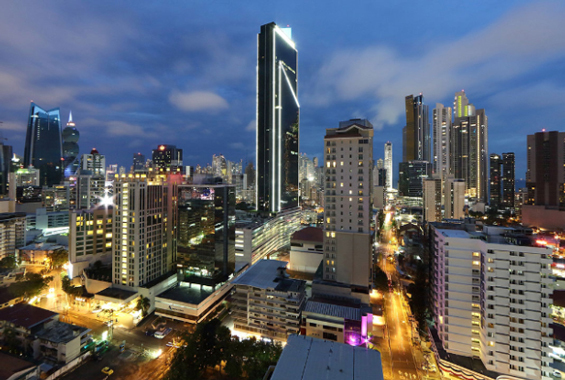 Hyatt Place Hotel in downtown Panama City can be found in Bella Vista, just 0.2 miles from Via Espana and 2.5 miles from the Metropolitan Cathedral of Panama. The popular hotel is also within 10 minutes to Canopy Tower and the National Shrine of the Heart of Mary. Located in Panama City’s Banking District in the Financial Zone, Hyatt Place is the perfect place for families looking for fun as well as business travelers in search of professional accommodations close to the Atlapa Convention Center. 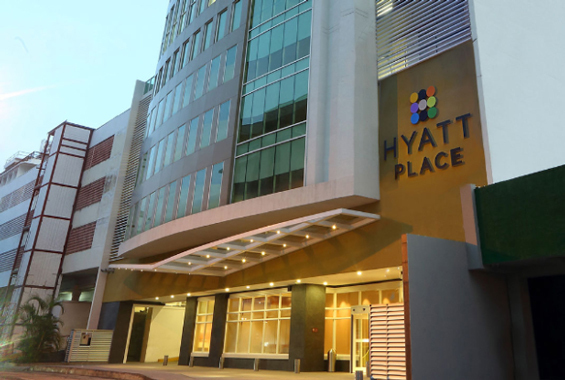 Hyatt Place Hotel has a total of 165 spacious rooms featuring a Cozy Corner sofa or sofa-sleeper. Begin your day with a free hot buffet breakfast available to all hotel guests. Enjoy a daily serving of yummy hot breakfast items, as well as fresh fruits and premium coffee. For the remainder of your daily meals, head to one of several restaurants available near the hotel. 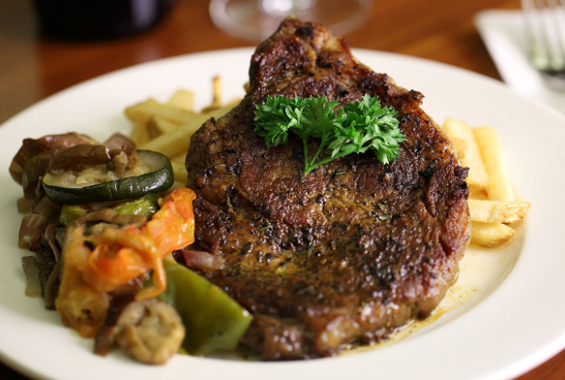 These eateries offer a wide range of cuisine inspired by countries all over the world. 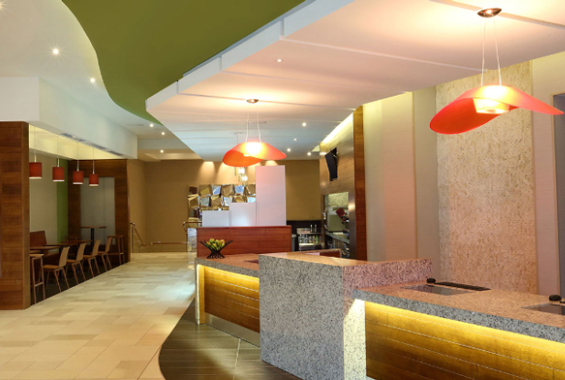 Hyatt Hotel also offers a bar/lounge on-site, as well as a coffee shop or café. In your room, you’ll find free bottled water, a coffee/tea maker, and a refrigerator where you can store your own favorite foods and beverages. If you’re in Panama City for business, Hyatt Hotel has you covered. 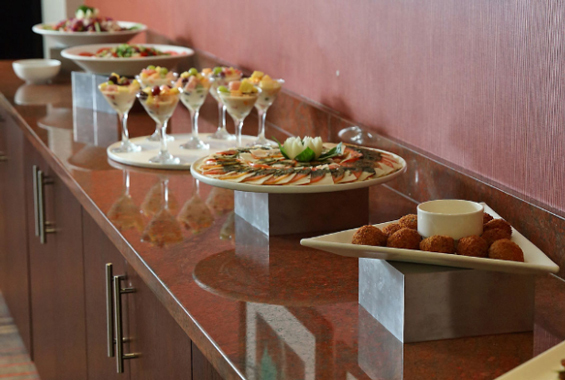 The hotel has more than 4,500 square feet of meeting space where professionals can gather for nearly any reason. 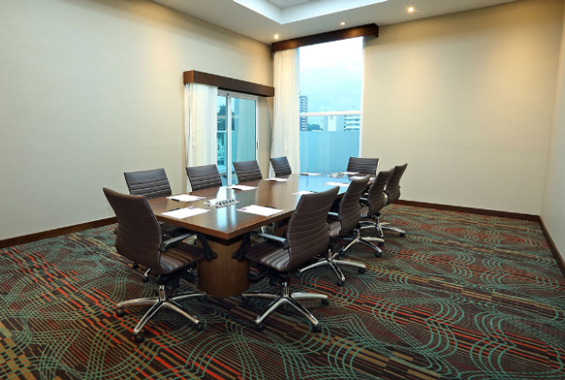 The meeting areas are divided into five elegant rooms which feature plenty of natural lighting. If you need access to the Internet, the hotel also has a computer station as well as free Wi-Fi. Each of the guest rooms is also equipped with free Wi-Fi and free wired high-speed Internet to allow guests to take their business in and out of their rooms. Plush rooms are elegantly decorated with great attention to detail to give guests an unforgettable experience. Each room is equipped with flat-screen televisions, mini-fridges, and coffee and tea makers. All the rooms also have desks and pull-out sofas that allow additional guests to stay in a single room with ease. 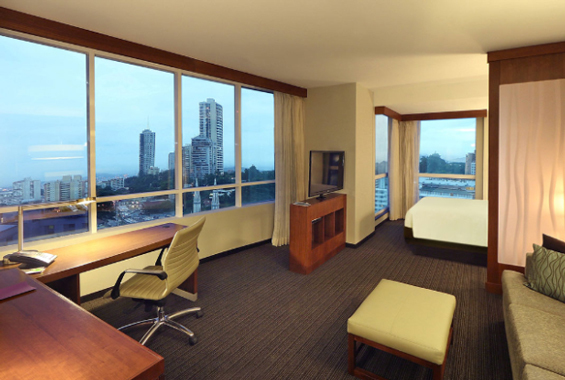 Many of the guest rooms also provide incredible panoramic views of Panama City. Parking and breakfast are complementary at Hyatt Hotel and a fitness center is available round-the-clock. There is also an outdoor rooftop pool available for guests who want to relax and take a dip. Built in 2014, Hyatt Place Hotel is a fairly new addition to downtown Panama City. The front desk is staffed 24/7 and are available to help with luggage storage, cleaning, laundry, and securing valuables. Free newspapers are available in the lobby and an elevator is available for guests who may require this service. When you stay at Hyatt in Panama City, a Gallery Host will be available to assist you with any orders you may desire from their 24/7 Gallery Menu. This extensive menu features goodies like sandwiches, greens, and various local and regional specialties. At the Coffee to Cocktails Bar, you can also enjoy premium beer, wine, or specialty coffee over friendly conversation. If you’re planning on staying in Panama for a while, Hyatt Hotel also offers extended stay amenities. These amenities include complimentary hotel-wide Wi-Fi internet access, a complimentary breakfast buffet in the a.m., access to the Gallery Menu served fresh 24/7, Grab ‘n Go sandwiches, greens, and bottled beverages for when you’re on the go, and specialty coffees, teas, and other beverages from the Bar. When planning your upcoming trip to Panama City, make where you’ll be staying a major priority. For exceptional service, consider staying at the top-rated Hyatt Place Hotel.